By eliminating all that weight, it is also more comfortable and light-on-your-dog. 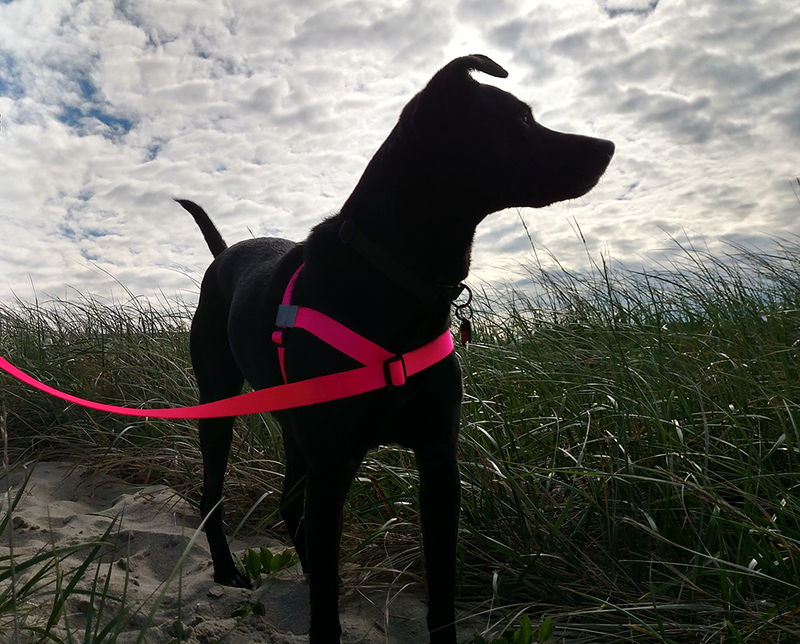 The NEO harness is for those humans, and dogs, who appreciate the difference the best equipment and tools can make. The integrated leash part is 6 feet, and it has the same large Nor'Easter handle as our traditional leashes. If you have a puppy, we have a Puppy Promise, where the next size up is just half price. Yes, even if you have a Great Dane. Omg! This is a game changer for me and my Dax! He is a rescue dog 70lbs is strong pure love. I have fallen a few times walking him. This leash and collar changed all that! Today was pure joy! Thank you thank you, I am so happy!! I am so, so happy with this product. We have a one year old GSD who is amazing in so many ways. However, dog walking has been miserable for both us of due to her constant pulling, despite endless, repetitive training. I was literally at the end of my tether and Maddie wasn’t having the fun she should have. We live in England and whilst on holiday recently in Wales, I noticed a Labrador walking beautifully, wearing one of your harnesses. The owner told me all about your product and how amazing it was. I ordered the all- in -one harness and lead that day! After fast delivery, the order arrived two days ago-we have total transformation on our walks!! My girl now walks beautifully, I have only needed to tug very gently to correct her once and she instantly responds but without the head jerk or discomfort of a traditional lead pulling her neck. I will be sharing this will friends and colleagues who struggle with dogs who pull on traditional leads. Also love your website and the no fuss returns policy. It’s clear you genuinely care about customer and doggie satisfaction! Thank you so much for a fantastic product which genuinely delivers on its promise! Just wanted to let you know I am thrilled with this harness!!!. No more worry about dew claws getting stuck in the O ring. Also this style is less likely to get caught under my pugs legs when I let her leash out for her to do what dogs do on the grass, lol. I am keeping the original to use in the car as the seat belt clip will attach to the O ring. Again, thanks and also for the speedy service. My husband said that the Neo was GREAT on their walk last night! Can’t wait to try it. Thanks for everything - I got the extra cards too and will pass along! Great to exceed customers' expectations! I purchased the all in one harness for 91 pound Golden Retriever, Duke. Being just 14 months, he still has a lot of energy and is pure muscle. This has made walking him just a delight!!. We will be adding another Golden Retriever (8 weeks old) to our family in about 2 weeks and plan on ordering another harness for Duchess. Want to start her out early with a harness to get her used to walking on a leash. Have recommended this product to several friends and family members. This company is the best. I love the product and the service! I just love my harness when I walk Shadow. She is 70 lbs. & so so strong!! I am only 5' & 105 lbs. This really works for me. Wanted to give the new harness a little bit of a workout before writing back to thank you for your outstanding service! Not only did you go off the program to make us a Chocolate NEO, but you did it the next day! I am so blown away and appreciative. 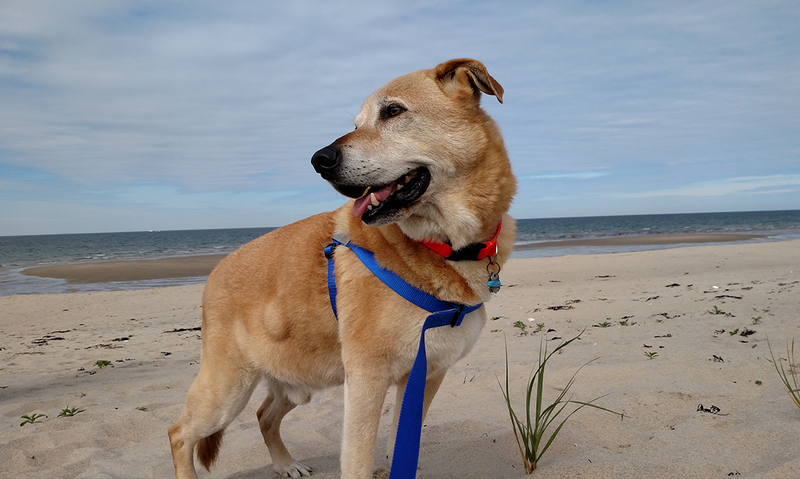 There are three of us who routinely walk Hudson and we all love that the buckle on his old setup is no longer whacking him in the leg with every step. He never seemed bothered by it, but we all were. The all in one is very convenient and so very lightweight. Thank you again for going above and beyond! Finally a harness our little 16 pound Doodle will tolerate! After trying three other expensive harnesses unsuccessfully I decided to give the NEO a try after doing some research on harnesses for small dogs. It is amazing! Goes over his head so easily, no hardware clunking against his legs, he seems comfortable and no protesting anymore when we bring out the harness, and lightweight for a lightweight dog. It has totally changed the way he responds when we say “Let’s go for a walk.” He is happy and we are overjoyed. I don’t usually write reviews but this was the best purchase we have made in a long time. This harness-leash combo could not be any more awesome!!!!! I just purchased the Neo for my frisky 3-year old Vizsla mix rescue. She had always pulled like a sled dog on every walk, so I began investigating harnesses with the lead in front. The first two brands we tried helped somewhat with the pulling, but neither could be adjusted to fit well. They were either too stiff or involved too much hardware and too many adjustments. My dog did not like them and continually got her front legs tangled in the slack that hung down the front. A friend recommended the WalkYourDogWithLove site. 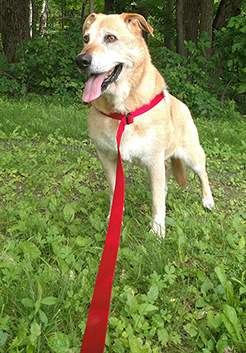 We ordered the Neo style, and our walks have become hassle-free, comfortable, and easy! Super easy to fit and adjust, she loves to put it on and parade around the house, and no more getting tangled up in the heavy hardware hanging down in front. Just today, I lent the harness to my neighbor to try on her young hyper lab. She was amazed at how much easier their walk was and can’t wait to get a harness-leash too. And, like my dog, her dog loved wearing the harness. This product is genius!! My 70 lb lab is so much easier to walk with. We have only used it 2 days now, but what a difference! We previously used the Thunderleash which worked ok at first (no choking her), but she then began to pull me around since it’s a behind the shoulder leash, not leading from the front like WYDWL. It is great to finally have control and have us both be happy walkers! Poppy really enjoys the integrated leash because there is no hardware banging against her little knees. I'm really glad we heard about your company from the going to dog training. The instructor talked about it and a German Shepard that came to class was wearing one. Best leash ever...! I’m glad I bought it...! I tried 4 harness-leashes- plus two other leashes. Yours is the best- my neighbor even bought one for her pit bull also. She lives on my same street. Her dog use to pull her so much- she loves it too. Thanks- I love walking my dog now...! I just got mine last week and had the best walks with my 5 month old, 75 lb, King Shepard. She looked confused at times but was feeling exactly what I wanted her too. So excited for the rain to stop and get some more walks in. Has definitely changed our walks! Thank you soooo much!!! I love my harness!! I absolutely love this product. I used it today when I got it out of my mailbox. My dog did not pull me all over the city like I'm a rag doll. Thank you. This product really works. Love, love it...what a difference from standard leash!!! Did take me a while to figure out how to use...but when it FINALLY clicked in my brain...easy as can be!!! Thank you! I use my harnesses all the time and love them. I was hopeful when I ordered this for my dog Rokko. He gets so excited when he is on a walk that he pulls and makes both of us miserable. He was using a gentle leader that didn't really help. 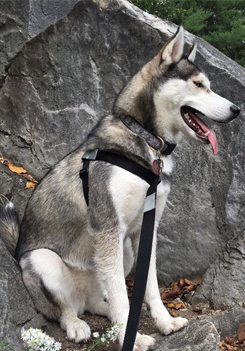 When I put the NEO harness on him (so much easier then the gentle leader!) we went for our walk and I was SO happy! He still pulled some but it was so much better!! Now we both enjoy walking! Thank you so much! My 70 lb pup pulled me down on ice 4 times in a month. From the first time on this lead, she has not pulled and the lead was slack! Love it! So, I actually just received mine in the mail today, and headed straight out the door with the pup. We'd been using an "Easy Walk" harness, which I could NEVER get adjusted correctly, and it was so heavy in front that it always sagged and then it started pulling on her shoulders painfully, and I was worried about doing some long-term damage to her shoulders...awful contraption, avoid, avoid, avoid. Now, the Walk Your Dog With Love harness, however, is simply a COMPLETELY different design and absolutely WONDERFUL experience! I think me and the pooch just had the most enjoyable walk EVER! No pulling, no sagging, easy on, easy off...FANTASTIC design. I can't recommend this product enough. Five out of five stars. Really, really happy with it, and thank you SO much for designing such a wonderful harness!!! Our German Shepherd pulled us constantly making it extremely hard to take her on a simple walk. My husband ordered this amazing new harness. Surprisingly we are now able to walk around the block! I am so excited for spring, by then she will be ready to explore the whole neighborhood! Thank your for such a wonderful invention. I would highly recommend this product. I have tried every harness and leash out there from vest style harnesses to whackywalkers and bungees. My dog is only 25 lbs, but pulls like crazy. Especially if there is a bird or squirrel or cat! This neo thing looks like such a simple bit of strapping, but it is light and easy, and my dog just responds as if I am magical. People actually think i have a well-behaved dog. She still gets excited about cats and birds and squirrels, but she cant yank my arm out of its socket anymore. I bought one for my German Shepard. I love it, he walks perfect, no more half dragging me. This harness is a game changer! Awesome! My Huckleberry loves his new harness—and so do I! I recommend it to everyone we meet out walking. I just returned from my first walk with both of my dogs using the NEO harness. I can't believe the difference! Instead of being pulled down the road by my two hound mix dogs, I am now in control. The harness works really well. I cannot recommend this harness enough! Thank you for making walks so much easier and pleasant! Got this for my big 2 year old English Bulldog. Works great! This thing works! I can now enjoy my walks instead of a pull & tug match! I am amazed at the difference that this harness has made! It really does all that it says and makes walking my dogs easier and so much more enjoyable. I originally bought a sportso harness, and it is great. I decided to try the NEO the next time I ordered and it’s even better. With the harness and leash all in one, I think it fits a little better and it definitely is lighter which I think makes my dogs more responsive to my movements. I have absolutely nothing bad to say, great product, great customer service! We enjoy the 'no pull' way of walking. Love our Walk Your Dog with Love leash and harness!! 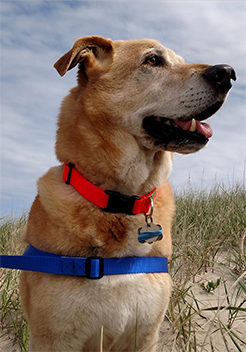 Using the harness has provided relief for everyone involved in daily walks. We just got this harness last week. Absolutely love it. My Lab is much happier with this harness than the our gentle leader!!! This harness is incredible. 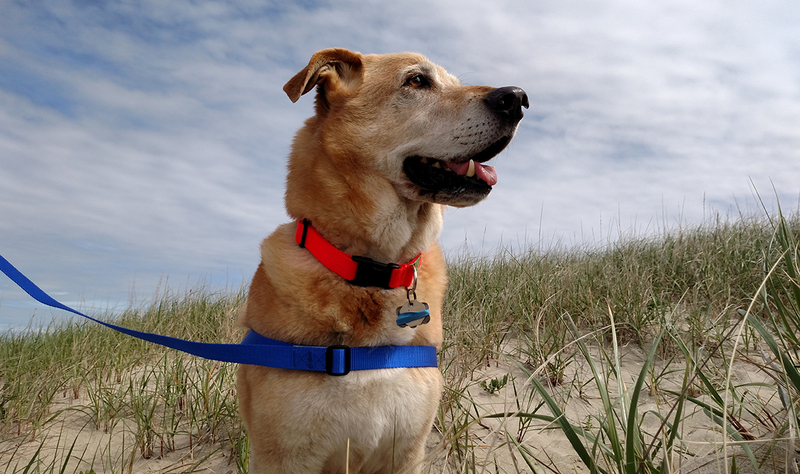 My dog is no longer pulling me and choking himself on our walks, and I have control of him and where we go. It is a totally different experience walking him now. Brilliant! Thank you thank you! This harness is GREAT! Very easy to adjust and fit, light weight and super easy to put on and remove! Very well designed and constructed too! No more uncomfortable or injurious walking apparatus on my dog! She LOVES it! Their quick email advice and recommendations to my questions concerning sizing were spot on the money. I also purchased their Safety Belt, as I hated having my dog unsecured in the vehicle. The headrests in my truck are one-piece with the seats, so I hook the belt from her harness to the upper shoulder belt tether at the door post. She can move around and even lie down, but she won't be flying into the dash/windshield/me in the event of an accident! It also prevents her from moving over to my seat when left alone in the vehicle, which is an added bonus! Simple, but very effective. Thank you for producing these fine pet products, and doing so in the USA, from USA materials! I sincerely hope you get rich from your efforts! The only negative here? "WHY didn't I think of this?" I used mine for the 1st time today and it was great!!! This harness is the best thing ever. ELIMINATES her pulling! We love the harness. It is without a doubt, the easiest to fit and the most effective leash/harness we have ever used with our pulling Aussie puppy. I love the new all in one leash/harness, especially for running. We did our first 5K for k9 cancer this fall. 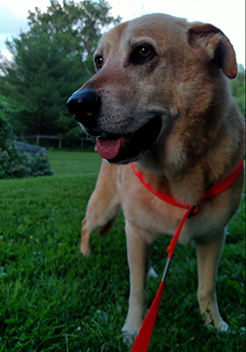 I have used your harnesses for 10 plus years with 3 different dogs ranging from 120 lbs down to my current 60 lb. lab mix. They work great and keep my dog comfortable and safe. I tell people about them all the time. This works very well on my compact muscular Lab! As soon as I put it on my 9 month old Cockalier, Sammy it was like he totally forgot how to pull!! I enjoy much longer walks with him now! The best harness for sure- easy on easy off and never need to readjust it!! We are loving the NEO! I only use the walk your dog with love harness on my girls, no other harness comes close. We just received the new NEO all in one today. It is fantastic!! We walk about 5 miles daily. Both my girls love birds, squirrels etc, this harness is like having power steering and keeps us very safe. I got it and what a difference, I love it...you were right! I love this style both of my kids are so much calmer on their walk. Immediate change! My Pittie used to walk me, not the other way around. I bought this harness and it was like magic. We can now go anywhere and he doesn’t pull and tug and make a fool of himself. Worth every penny and then some! Tried one of these today. I was shocked that it truly worked!!! I am so glad I found your harness! I pet sit, and with two of the yellow labs I walk, I end up at the chiropractor after a week. My hubby found this harness online, and we took a chance. Best thing we ever did! I used it for the first time on my large female lab, and I was shocked. I had quit walking her except at night when no one was around, because she knocked a lady over in the street even though I still had hold of the leash! She so far has walked by squirrels and people and I was able to control her. You are right that it is easy to slip over head, but if you have a hundred pound dog who is a jumper, squirmer, roller, completely out of control, it is hard to get them to stand still to slip it over the head! Amazingly, even though the harness doesn't seem to fit just right, it still worked. Am hoping to work out the kinks. Thank you for a great product! I couldn't even walk my Lab mix, she just wanted to run and pull. I saw you at a camping expo and decided to try this harness. It has been a blessing! I cant even start to tell you what a difference this makes. Thank you, we are walking nicely now! We have this for our Golden mix and it works. Our Golden was a rescue and never given any leash training. This has worked wonders for us. PS - he’s 86 lbs. Love my harnesses. I have the NEO for both my Aussies. I bought one of these a few weeks ago and the transformation was unbelievable. Thank you for this product! My dog is calmer on the leash and NEVER pulls; he didn't even try pulling, which was not what I expected.. He used to be a handful and a safety risk. And unlike other harness types, this one is so easy to put on and take off. Worth EVERY penny! Just walked my 12 year rescue Lurcher ANNABELLA on Jazz's new harness and lead. She was a little confused at first as to why her 'pull' was ineffective, but then relaxed into a beautiful pace lead by me. Who said you can't teach an old dog new tricks! Feel a third purchase coming on! I just bought 2 of these for my Husky /Whippet and Shepherd /Bernese mountain dog. I love them! Was so excited to find a harness made in the USA!!!! I will be sure to pass on the word!!!! The NEO harness-leash has arrived in the meantime, and Turtle (my dog 10lb female puppy shitzu-bichon mix) and I love it! we tried it out right away of course :) It's great! I will be ordering a second one in short in neon pink. The harness fits perfectly (not too snug not too loose), the leash is light and most importantly Turtle no longer has a heavy metal karabiner hook dangling between her legs. No more tangled leash feet. I can tell, she does not feel constricted by a leash, which makes "loose-leash walking" so much easier. Wishing you continued success with your harnesses. I can promise that I will be heavily promoting it in my "hood". We received our harnesses and the NEO style is perfect! Of course we walked the dogs asap; fit and function were everything as advertised! I hesitantly purchased the all in one NEO harness and please let me tell you why. I have a challenging 2 year old Husky mix who likes to pull. I wasn't initially comfortable spending 50$ on a harness when nothing else seemed to work. I have tried leashes, harnesses, and even gone to the expense of a personal trainer. 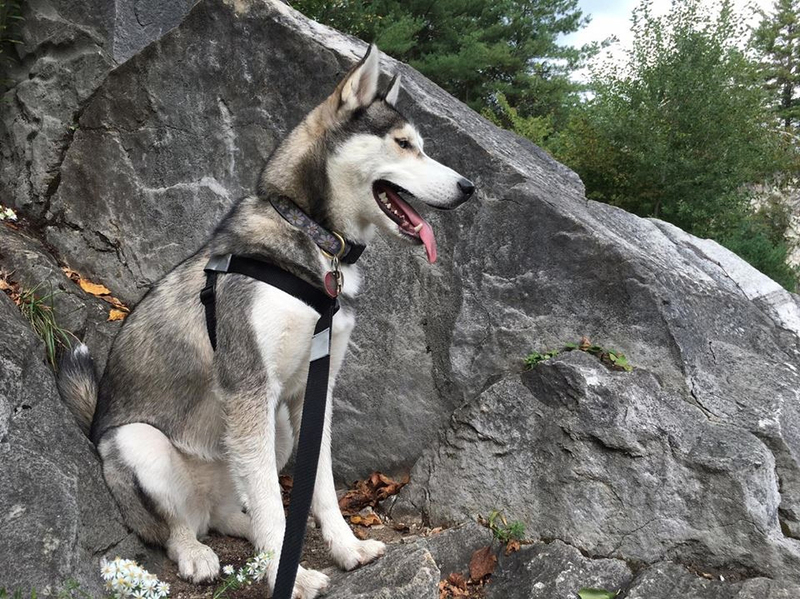 The problem I have is that my husky mix pup thinks he should pull me (as he breed does) but I have Multiple Sclerosis and my legs do not have the strength to hold him back. I was at the point of finding him a new home. Until...I found this leash. The very first night we followed instructions given and I was able to walk with him with no pulling. He followed my lead and after a short walk I literally walked back to my house in tears. It was so easy I could only cry because it has been so hard in the past. I cannot believe how easy it was. I give so much credit to the person who designed this because it is allowing me to exercise my dog along with myself. I am now able to walk him on my own with no fear of him escaping from me or of me falling down. I can't explain what freedom this simple harness has offered me. Thank you so much for creating this harness!! 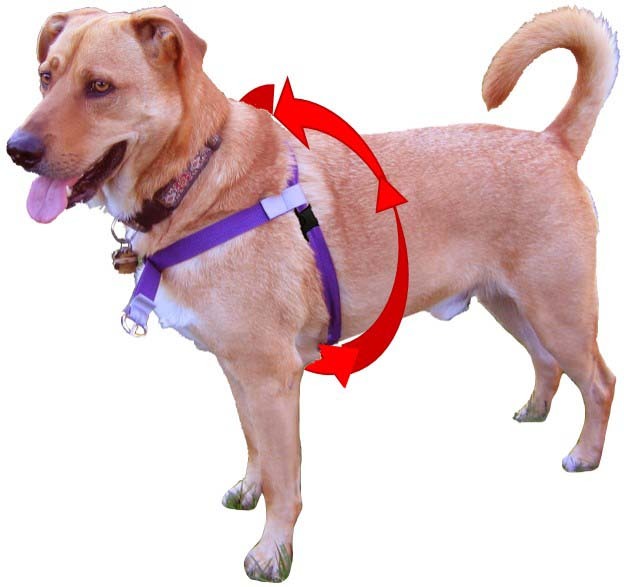 After much research, I ordered the Walk Your Dog With Love NEO harness system this week. Hot pink for my Sugar Cookie - so everyone stops calling her - him. Customer Service was very helpful redeeming my gift certificate. Great turn around time too. I just wanted to tell you how happy we are with the harness - Humphrey, in his typical Cocker manner, still always wants to be up front, but with the harness, he's just so much easier to manage. I've had a few people remark on it already, so am spreading the good word! Kind regards and woofs! It works for both of my German Shepherd's! NO CHOKE • NO PULL • MORE LOVE Says it all! 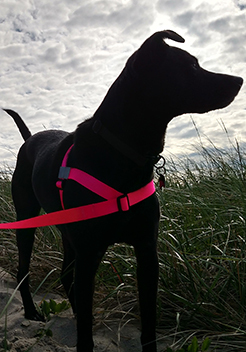 The NEO All-In-One Wonder gives you the best of both worlds with a dog harness with the leash built right in. 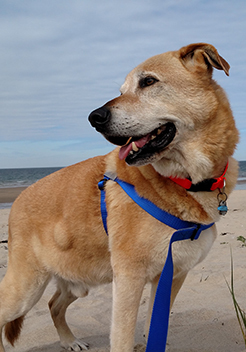 By joining the harness and leash into one there is no additional weight for my pet (Jax) or for me. Our walks are a lot more enjoyable and Jax walks calmly alongside us. Quality was the first thought for this product and the 3M Scotchlite reflective material is great for walking at night. So happy we found WalkYourDogWithLove.com! This dog harness is working wonders with my Eurasier boy! 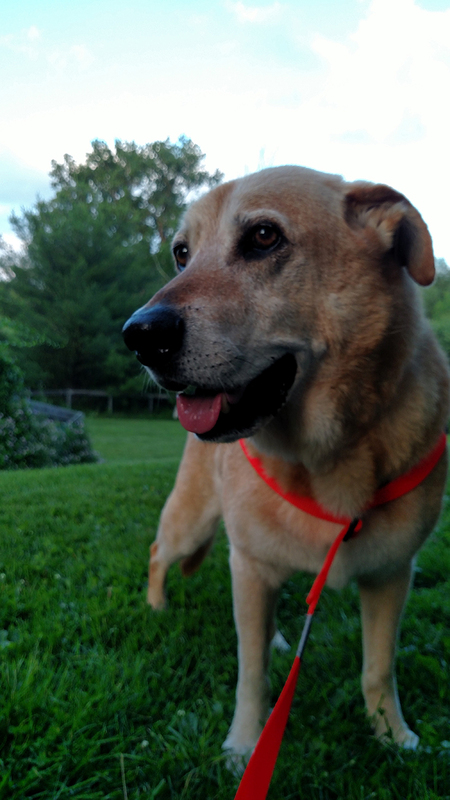 My new 4 yr rescue boy Jazz is definitely more Chow like, stubborn strong and determinedly fixated! I have been to emergency room after being pulled through the air onto my shoulder! Also if he doesn't want to go in a certain direction, he backs up and rotates, spinning me into the road more than a few times. I understand I need to learn to handle him also, but this harness helps me manage his behavior. He now knows I am in control and even tests it but soon concedes. We are enjoying wonderful walks together and both our confidence is growing. Thank you very much for designing it! Omg! Your dog harnesses changed our lives!! I have 4 rescues, (2 shelties & 2 bichons) two are scared and timid and 2 are aggressive and very brave. I just took my first walk with two at a time and actually feel like I got exercise and NOT just my arms from the pulling! Thank you so much! Thank you, thank you, thank you! Just wanted to let you know how happy I am with this dog harness. My 30+ kg Standard Poodle for 6 years has pulled when walking. Have tried numerous walking harnesses over the years. Her NEO all in one harness/lead arrived today. I fitted according to video and oh my goodness, success first walk. So happy with this item that I've just ordered a second one for my other Standard Poodle. She's ok with any walking aid, but I want them both to have the comfort of your harness. I am 70 years old and often balked at walking 60+ kg of dogs due to one of them continually pulling. We've just had a great 2 km walk and I now have an ex puller !! So much better for both of us. I'm totally gobsmacked at how this worked as you advertised. I have had my harness for a couple of weeks now and I love it. I got the one that has the attached leash- the NEO dog harness- which is great. My 90 pound German Shepherd no longer pulls me around. She walks calmly at my side . I am elderly with severe arthritis so this is definitely what I needed and my dog likes it also. I can't thank you enough for making it possible for me to enjoy taking my dog for a walk. I bought this NEO, the one piece dog harness and leash. I love it and so does my dog. I love, love, love my NEO "All in One" dog harness. My dogs are better behaved, more relaxed and walking is a pure treat. Thanks again for all your help, you ROCK!